At the age of 15 Bob became interested in woodworking while chopping firewood for his mother in northern California and as he made various wooden things with whatever tools were available, his brother would sell them and Bob's enthusiasm for trees and the woods they produced quite naturally, increased. In 1967 Bob joined the Coast Guard and was fortunate to be in construction, expanding his knowledge of putting things together. While stationed on Oahu from 1973-1976 Bob learned more about local woods by contact with local woodworkers/businessmen and their generosity with scraps. In 1978 when re-stationed at Sand Island Bob was in charge of the construction team, visiting all of the Coast Guard stations in the Pacific (and gathering indigenous woods). Making wooden anythings quickly became his hobby and Bob soon realized that it might be possible to make a living doing something he really enjoyed - working with wood. Bob retired from the Coast Guard in 1988 and, still on Oahu, decided to make Hawaii his home, with his wife Linda and four children. Bob now makes a living turning bowls and making custom and Hawaiian style furniture, using only locally grown woods. In 1991 Bob completed a collection of 70 bowls made with 66 different local woods. 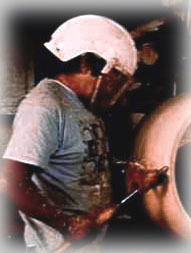 The largest bowl He´s turned measures 3´ x 40" high and weighed over 1,500 pounds when put on the lathe to be turned. (He likes big things!) Bob´s works have been displayed at different galleries including the Honolulu Academy of Arts and have been featured in local and national television and news publications. Bob has been named a perennial winner at the annual Woods of Hawaii Woodworking Exhibition, each year receiving an award or two. One of his entries, a spectacular 9 foot wide by 6 foot tall folding screen depicting local scenery, and made from more than 101 different island grown woods, received 3 awards in the HFIA Woods of Hawaii ´96, the 1st place Architecture, Artists´ Choice & People´s Choice Awards. Bob continues to receive various awards for his work displayed in different Shows. Born the son of a Coast Guardsman and having traveled around the world as a military dependant, Bob was exposed to many cultures and lifestyles, including Hawaiian, during his father's years of active duty. And through the course of years pursuing his own Coast Guard Career and later retirement into woodworking, Bob has developed his expertise in the craft of working with wood & is among the finest of Hawaii's Bowl Turners & Furniture Makers. Bob is the father of twin sons, Michael & Kevin, two daughters, Lani & Cristylin, four children-in-law and grandfather of six. For more information, email with RWB in the subject line.